People forget that you can freeze and store cherries simply and easily! Our farmers have worked hard this season to produce a bountiful cherry crop and Chelan Fresh cherries are readily available for at least one more month! The cherries this season are big and sweeter than ever! Now is the time to buy those cherries and continue to enjoy them immediately or freeze some for later this fall. Contact your Chelan Fresh sales representative to ensure your cherry program lasts well into August. 509-682-4252. Here are a few tips for freezing cherries. Thaw the cherries out as needed. They make a great semi-frozen treat, use frozen, pitted cherries in smoothies or thaw for your favorite recipe. 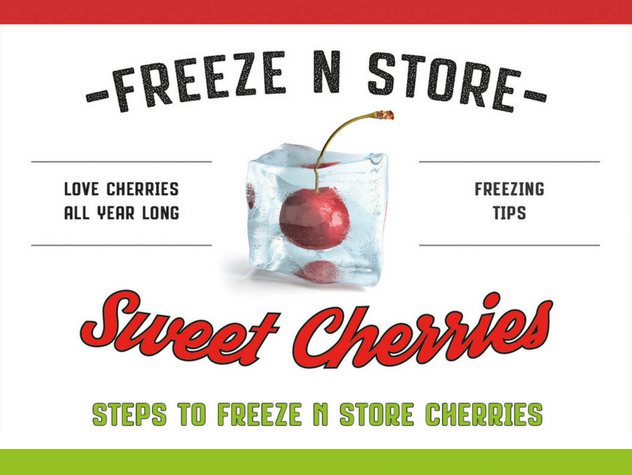 Freeze large quantities so you can enjoy cherries all year long!